With Archie Comics repeatedly proving – not just over the last few years but, really, throughout the character’s entire publishing history - to be willing to recast their characters through pretty much any genre filter available, I’m actually more surprised what they haven’t yet done to the gang from Riverdale. With superheroes, zombies, pop satire, crossovers, time travel, “baby” versions, teen soap opera, and horror under their belt (to name only a few), I’m surprised that we’ve never seen Archie 1602, Archie Beyond Thunderdome, Bara Archie (Barchie), Jughead’s parents get killed by crooks and he becomes a dark avenge-burger of the night, or the all-dog cast of Arfie. Really, the sky’s the limit. However, I don’t anticipate any immediate return to Archie’s celestial stamping grounds from the Spire Comics days. No, seriously, she's just really really drunk. Al Hartley - the hard-working hands behind a lion’s share of Spire’s output and possibly one of the most underrated straight-up GOATs in comics history (how many creators, especially in the pre-indy days, were accomplished as artists, writers, letterers and logo designers?) - carried over his work on the main Archie titles into Spire’s catalog of evangelical Archie titles. For better or worse. The gist of the books was a relentless torrent of hypercritical abuse directed at the godless sybarites of Riverdale, which I guess they deserve. I mean, Jughead’s shirt has an “S” on it. What does that even mean? They don’t live in Siverdale! His name isn’t Sughead! I hope they burn in Hell. It’s hard to pick a single Archie Spire comic to celebrate from the catalog (“Archie’s Car” boasts what I feel is the most compelling title, while “Archie’s Date Book” is possibly the most notorious among the volumes. 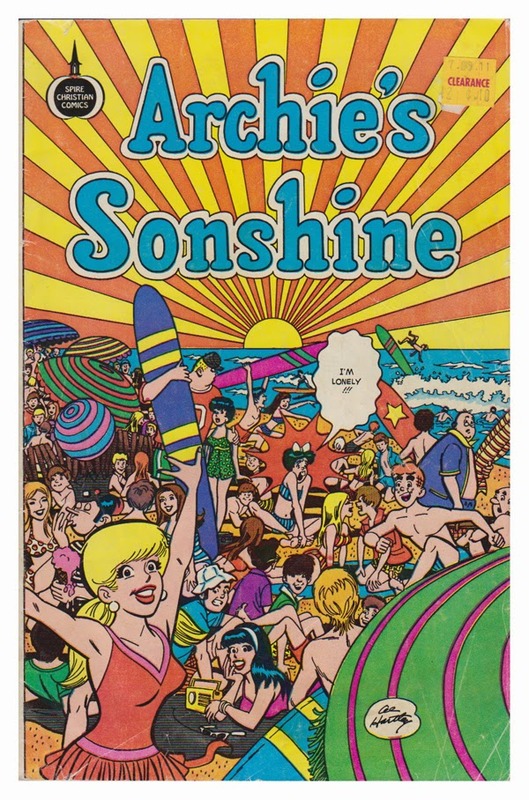 “Archie’s Parables,” relatedly, might be the only book suffering the sin of over-underlining its intent), but a personal favorite is “Archie’s Sonshine” (released in 1974), wherein the kids’ collective day at the beach is interrupted by a good-looking beardo on a mission. 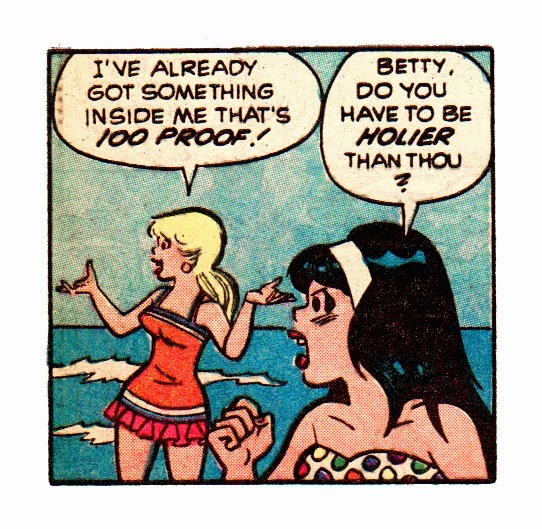 It’s worth mentioning that this particular Spire comic- which is built upon the backs of Archie being lambasted for his lustfulness, Jughead excoriated for his overeating, Veronica vilified for her vanity, Reggie ridiculed for his selfishness and Big Ethel shamed for her lack of self-confidence – would open with this caption. Oh, and also, Moose is criticized for being dumb. Yo, that’s just as God made him, that’s not cool. During the course of the sermon on the beach, the ersatz savior dispenses snippets of biblical wisdom punctuated by the high comedy of the Archie gang going about their daily business. The general message seems to be to shun earthly pleasures and vanities for the higher glory of God, which the kids appear to be all about except they’re back to acting like their old selves in the fifteen other Archie-related books released every month, whether you want them to or not. Maybe these are the Earth-2 Archie crew. 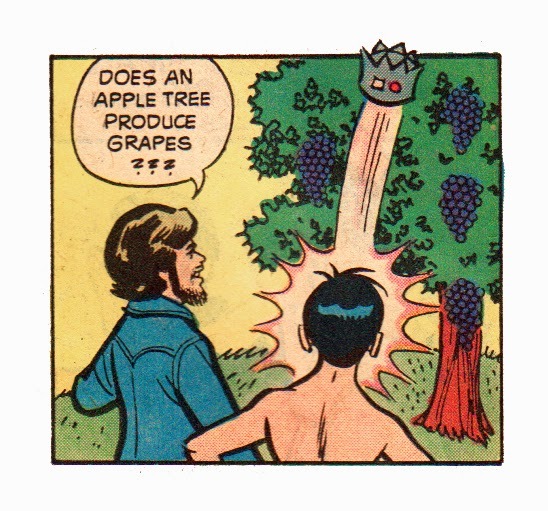 In fact, succumbing to a pretty typical weakness of evangelical fare, Archie’s Sonshine confuses its larger message with contradictory and flabbergasting smaller points, sometimes inserted for a gag. Moose and Archie are made to be punchlines as they act out “an eye for an eye” and “turning the other cheek” which … wait, I thought the Bible was pro-them-things. Kids on the beach protest religion’s penchant for prohibition, and by way of arguing that, no no, on the contrary, religion is actually all about freedom, he attempts to prove his point by listing a bunch of prohibitions. 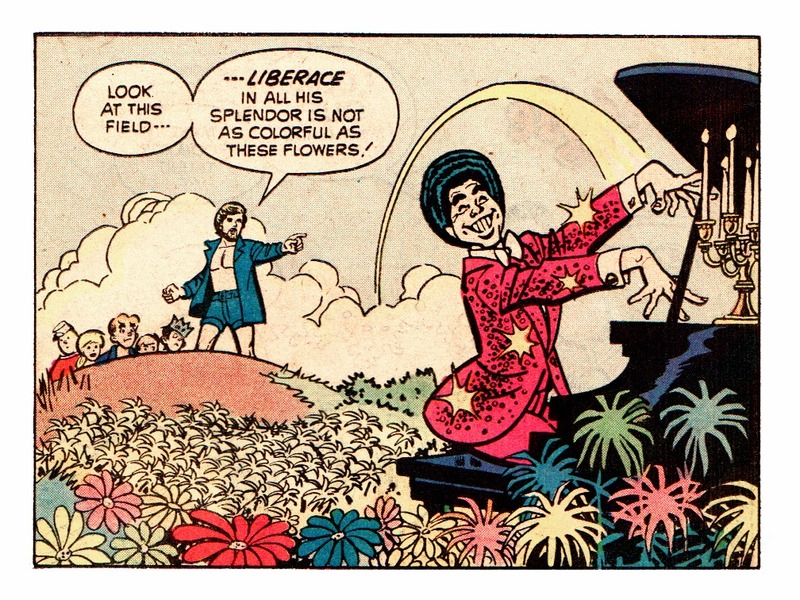 dirty movies, and as far as he’s concerned Liberace can take a running leap I guess. Still, it’s not about criticizing the faith but rather the craft exhibited in service of the faith, and along those lines I can at least admit that I genuinely love Al Hartley’s illustrations and story-telling (that cover alone is worth the price of admission, and there’s a series of panels wherein Archie drives his beat-up hooptie through the dunes and into the ocean, executed so buoyantly that it deserves particular recognition). If the advocacy for a more faith-fuled life failed to win me over, though, I’m in good company since the gang from Riverdale went back to being selfish, loud dicks right after this comic ended.